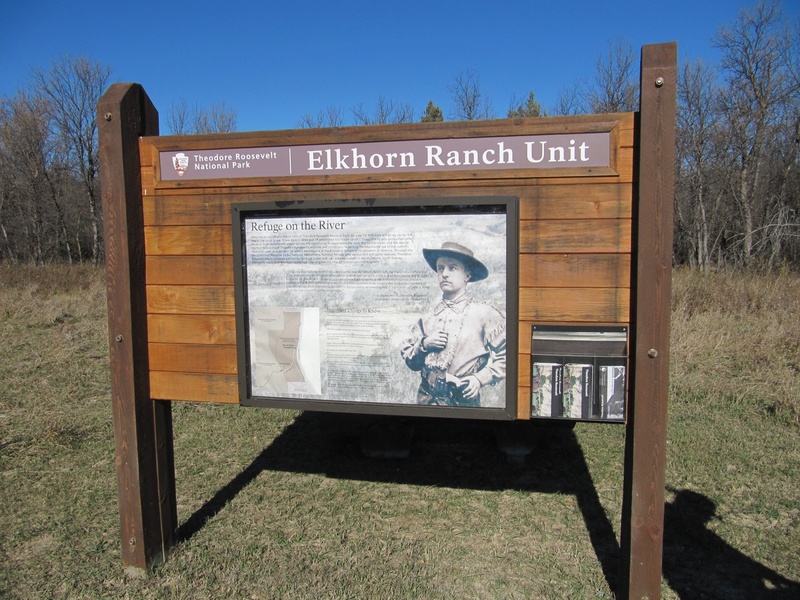 Signage at Roosevelt’s Elkhorn Ranch. Photo from September 2012. Theodore Roosevelt passed the American Antiquities Act of 1906 after experiencing what unencumbered industrialization had done to the American West. Since 1906, this initial piece of legislation has been amended and updated to reflect the changing times. I was thinking about that when I read this morning’s story in The Dickinson Press, “Oil Company Stakes Out Area for Well Pads Steps Away from Roosevelt’s Elkhorn Ranch.” A subsidiary of ExxonMobil, XTO Energy has staked an area immediate to Roosevelt’s 1883 Elkhorn Ranch just along the Little Missouri River in the badlands of western North Dakota. 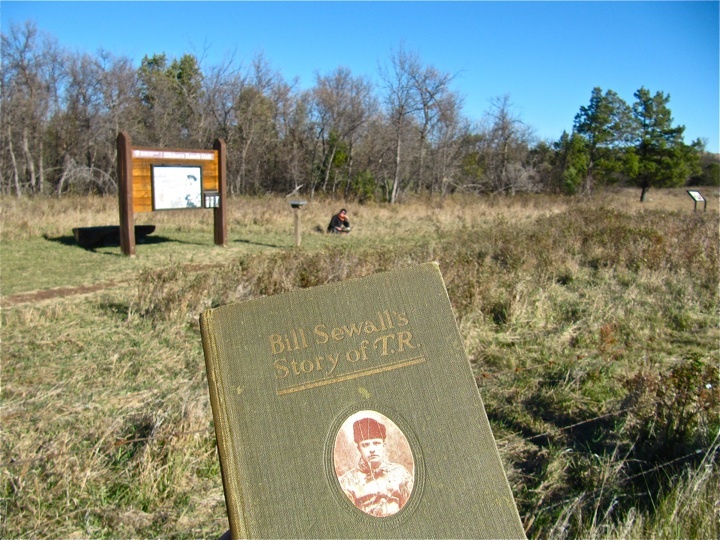 With the American bison nearly extinct (and who knows what other species), when Teddy was president he decided to draw some boundaries around sections of wilderness for preservation. He did this for both applied and philosophical reasons. By setting aside and declaring these spaces sacred, us Americans would be able to engage in recreation (when unpacked, the word means re-create), and we would also have a kind of common cultural datum that we could all associate with from one generation to the next. These cultural datums provide society with stability in that everyone has a common point of reference. “Hey, did you go to Elkhorn Ranch last weekend?” The response is, “Yeah,” and both individuals know they experienced and perceived the same looking landscape, the same space, but at different points in time. This is what David Glassberg was getting at in his 2001 work, Sense of History. After attending two meetings in Bismarck that concerned the Killdeer Mountains in January and February, 2013, I and others increasingly believe that this is fairly meaningless to the majority party bottom-liners in our state government. I’ve thought about this, and wondered if there was a better way to bring our State Industrial Commission up to speed. Sometimes folks go to the Elkhorn to read about the Elkhorn. Photo from September 2012. The State Industrial Commission was originally formed in 1919 with the idea that it would guide industrial development in the state. I am not against industry. In fact, I don’t know how someone could be “against” industry. It would be impossible. I recognize it as the substructure upon which the superstructure of our culture rests: if you like the arts and humanities, you gotta have an industrial foundation. In 1919, only 30 years after North Dakota had gotten its statehood start, a three-person industrial commission worked. Almost 100 years later, we are learning that an industrial commission with only 3 voices on it is not working for a state with a population of approximately 700,000 (and growing). As of March 19, 2013, the only three voices on the commission are as follows: 1) Jack Dalrymple, who was born into family Bonanza farming in Casselton, and received a bachelors in American Studies from Yale (I think under Howard Lamar, who wrote a great piece of scholarship entitled, Dakota Territory 1861-1889: A Study in Frontier Politics ); 2) Wayne Stenehjem, who has a juris doctorate from the University of North Dakota (Wayne’s father was a former president of our Bank of North Dakota; and 3) Doug Goehring, who operates a 2,000-acre farm near Menoken (note: at the end of this blog posting, I have cut and pasted the public Meet the Commissioner profiles to this blogspot). These three are supposed to listen to Lynn Helms (who holds a bachelors of science in engineering from the South Dakota School of Mines), and Lynn is supposed to be an expert at informing the commission on approving drilling permits. At the last meeting I attended on Killdeer Mountains, Lynn attempted to explain the archaeology and history to the three commissioners, and this was unfair to him: Lynn’s training is in engineering and his professional life history has been in the oil business. He indeed is familiar with the workings of his profession. But when it comes to history and archaeology, he is tasked with learning about and briefing the public on two disciplines that professional historians and archaeologists think about incessantly, 24/7, 365 days/year, for their entire lives. 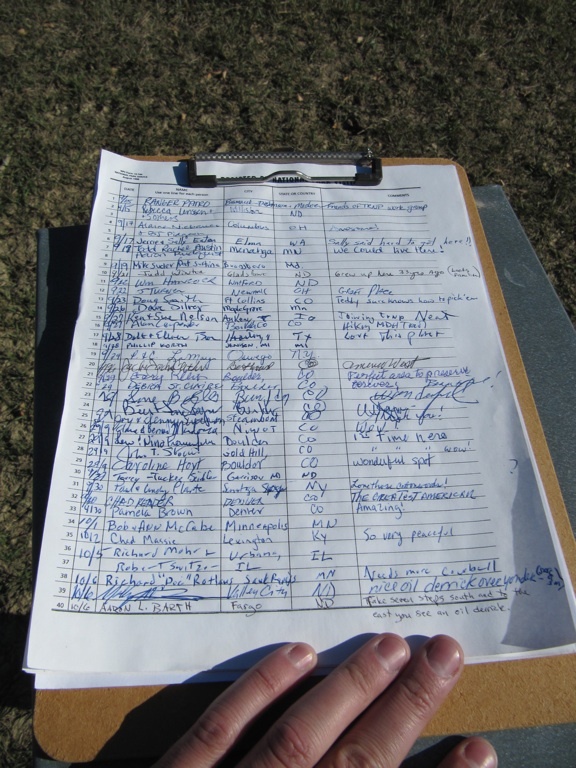 Public visitor sign-in list at Roosevelt’s Elkhorn Ranch in western North Dakota. Photo from September 2012. The three of these commissioners reflect just a small cross section of North Dakota society, yet they are tasked with the job of making decisions for one and all. This isn’t 1919 anymore. It is 2013, and it is only fair to modify the industrial commission accordingly. Here is one idea: the industrial commission needs to be expanded to a board of 12-to-15 members. For example, in addition to the three members already on the commission, we need to add the following: 1) a medical doctor; 2) an economist; 3) a pastor, priest and two nuns; 4) a biologist; 5) a historian; 6) an archaeologist; 7) at least two Native elders; 8) a cattle rancher; 9) a banker; 10) an ASE-certified mechanic; 11) a philosopher of ethics; 12) an IT/Web-2.0 expert; 13) an English major; 14) a soldier-veteran; 15) and so on. To be quick and short, this would reflect a much greater cross-section of North Dakota society. It is just an idea, nonetheless. And it is unlikely to gain any traction in this legislative session (North Dakota’s 63rd). But perhaps in number 64 or 65. Born October 16, 1948, Dalrymple grew up in Casselton on the family farm, established in 1875 by his great-grandfather. He graduated with honors from Yale University in 1970 with a bachelor’s degree in American Studies and then returned to North Dakota to manage the farming operations. Dalrymple came to the North Dakota Legislature in 1985, representing a rural Cass County House district. He served eight terms, including six years as chairman of the House Appropriations Committee. In 2000, he was elected North Dakota’s 35th Lieutenant Governor with Governor John Hoeven and was re-elected in 2004 and 2008. He was elected to his first full term as Governor in 2012. Dalrymple is a nationally recognized leader in value-added agriculture. He was the founding board chairman of Carrington-based Dakota Growers Pasta Company, the third-largest manufacturer and marketer of dry pasta products in North America. His work in helping to found the company earned him the 2007 Ernst and Young Midwest “Master Entrepreneur of the Year” Award. Dalrymple served as chairman of the North Dakota Trade Office and the Governor’s Commission on Education Improvement. Attorney General Wayne Stenehjem was born in Mohall, North Dakota. He graduated from the University of North Dakota and received his law degree from the UND School of Law in 1977. Stenehjem was elected to the North Dakota House of Representatives in 1976, serving for two terms until his election to the ND Senate in 1980. He served for twenty years in the Senate until his election to the Office of Attorney General. Stenehjem served on the Judiciary Committee throughout his tenure in the Legislature, and was Chairman of the Senate Judiciary Committee from 1995-2000. He was elected President Pro Tempore of the Senate for the 1999 Legislative Session. In January 2001, Stenehjem was sworn in as the State’s 29th Attorney General. He was reelected in 2004, 2006 and 2010. Stenehjem is a member of numerous boards and commissions, including the Board of University and School Lands, Industrial Commission (which oversees all state-owned industries including the Bank of North Dakota and the State Mill and Elevator), Drug and Alcohol Commission (chair), Judicial Council and Pardon Advisory Board. He was named one of Ten Outstanding Legislators in the US by the Association of Government Employees, and is the recipient of “Champion of the People’s Right to Know” award; SBAND Legislative Service Award; “Friend of Psychology” award; the 2005 North Dakota Peace Officer’s Association’s Lone Eagle Award, was inducted into the Scandinavian American Hall of Fame in 2007, and was named the 2011 Bismarck State College Alumnus of the Year. A third-generation farmer, Commissioner Goehring, along with his son, Dustin, operates a 2,000-acre, no-till farm near Menoken in south central North Dakota, where they raise corn, soybeans, spring wheat, winter wheat, sunflowers, and canola. In the past, the Goehrings have also produced durum, barley, mustard, millet, safflower, alfalfa, lentils and field peas, and have had a feeder cattle operation. Commissioner Goehring is the former president and chairman of the board of Nodak Mutual Insurance Co. and a director of American Agricultural Insurance Co.
Long active in farm organizations, Commissioner Goehring has served as vice president of the North Dakota Farm Bureau and is a member of the North Dakota Stockmen’s Association, the North Dakota Grain Growers, the North Dakota Soybean Association, the North Dakota Corn Growers Association and the National Association of Corporate Directors. An early supporter of agriculture-based, renewable fuels, he is an investor in the Red Trail Energy Ethanol Plant at Richardton. Commissioner Goehring is a former director of the United Soybean Board where he served as chairman of the sustainability committee, domestic research committee, industrial uses and international marketing committee. He was a former director of the North Dakota Soybean Council, a former secretary/treasurer of the North Dakota Grain Growers Association and a member of USDA’s Area 4 Research Farm Steering Committee. He is the former president of the Menoken School Board and past chairman of the Bismarck Mandan Chamber Agriculture Committee. He chairs the Biotechnology Task Force of the National Association of State Departments of Agriculture, and is president of the Midwest Association of State Departments of Agriculture. Commissioner Goehring attended Bismarck State College and is a licensed medical laboratory technician. He attends Evangel Assembly of God in Bismarck. Helms earned his bachelor of science degree in engineering from the South Dakota School of Mines and Technology in 1978, but his oil field career began as a roughneck in 1976 working summers and holidays. After graduation Helms worked for two years as a production engineer for Texaco in all of the producing areas of Montana. In 1980, Helms joined Amerada Hess in Williston, N.D. While in Williston he worked as a production engineer, reservoir engineer and asset team leader on projects in Abu Dhabi, Alaska, Arkansas, Louisiana, Mississippi, New Mexico, North Dakota, Texas and Wyoming. This entry was posted on Tuesday, March 19th, 2013 at 10:25 am	and tagged with North Dakota and posted in Uncategorized. You can follow any responses to this entry through the RSS 2.0 feed.